There's a quiet revolution "underfoot" in the ski boot world. People are asking for lighter boots with excellent walk modes that they can use for a range of alpine and backcountry applications, and manufacturers are responding. 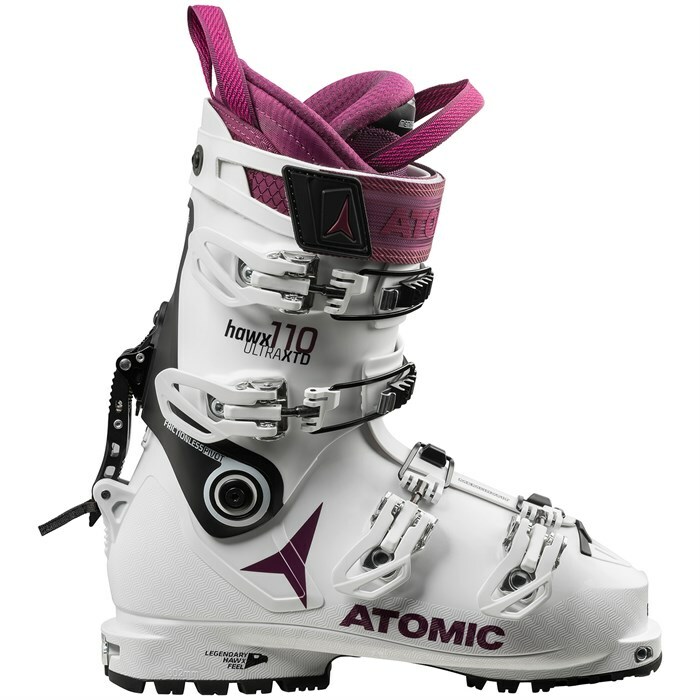 The Atomic Hawx Ultra XTD 110 W Ski Boots are this season's jewel in this crossover category, coming in lighter than many pure touring boots but with a genuine 110 flex that puts many performance women's alpine boots to shame - and all at a weight of only 1320 grams in a 24.5. Hard to believe? We thought so too, until we tried them, but this boot is the real deal and we recommend checking them out soon before they sell out. Memory Fit  Advanced heat-fitting technology creates a fully personalized shell, cuff and liner in minutes. The key is Memolink, Atomic's special additive that improves the moldability and stretch of their plastics. Expansion can be up to 6mm forefoot width and up to 10mm ankle width, resulting in a permanent and complete anatomical fit in minutes. See your bootfitter for details. Women's Specific Cuff Height + Shape  Wider, more fluted calf areas and a shorter cuff. Size Adjuster  Under-the-footbed adjusters that make the boot precisely half a size smaller. Bootfitter's Notes  The Hawx Ultra XTD is roomier than most 98 mm boots and can be heat molded to accommodate many average width feet. The shell can also be punched for extra width after completing the Memory Fit process. Very snug fit around the base of the ankle. Flex: 110  Hard charging, stiff flexing boot for the utmost performance. True Flex  Atomic's exclusive shell materials change less with temperature fluctuation, so your boots' flex changes less in cold or warm weather. Memory Fit 3D Platinum W Light Liner  Pre-shaped, thermoformable heel and ankle areas mean no pressure points and a great foot hold for the legendary Hawx fit. Breathable, Washable Liner  Perforated and quick drying. Progressive Shell  Revolutionary construction with optimized wall thicknesses. The shell walls are thicker in key zones where they need to be strong, then slim everywhere else. This makes the boot 25% lighter, and yet more stable, than other constructions. The best combination of snow-feel and power ever felt in an all-mountain boot. Energy Backbone  A reinforced, asymmetric backbone providing extra strength for powerful skiing plus enhanced lateral energy transmission for better edge grip. 15˚ or 17˚ Forward Lean  Remove the Free/Lock 2.0 lever and flip the backer chip to change forward lean. Free / Lock 2.0 Walk Mechanism  Taken from the successful Backland line, the Free/Lock 2.0 lever and Frictionless Pivots provide a smooth 54˚ of cuff movement for climbing, plus 15˚-17˚ adjustable forward lean for skiing. Frictionless Pivot  Igus polymer bushings reduce resistance and add durability for completely natural movement and effortless ascents. Skywalk ISO 9523 Touring-WTR Soles  Compatible with tech, tech toe / alpine heel, MNC, WTR and ISO 9523 compatible bindings. Powerful Binding Interface  For 100% energy transmission and TÜV approved alpine-safe release.